On one evening last week, I took my bike and went to the library to pick up a book. That was when I noticed two things. First of all, that I have a really old bike. One of the type that people can hear thirty meters ahead when it is dark because it makes wheeee wheee wheee (or rather, the dynamo does). And the weak light of this dynamo made me realise the second thing: it was dark! Darker than usual. Really dark! The street lights were switched off. And what occasion could a town council convince to switch off the street lights? Halloween? Nope, because although there are more and more children every year trying to start this tradition here, it has not really arrived yet. Maybe the kids should try a little harder to wear real costumes and not just a mask or a scarf (is it legitimate as a mother to refuse handing out sweets when the children are obviously not in costume when trick or treating?). No, there was another reason for the darkness: beets. 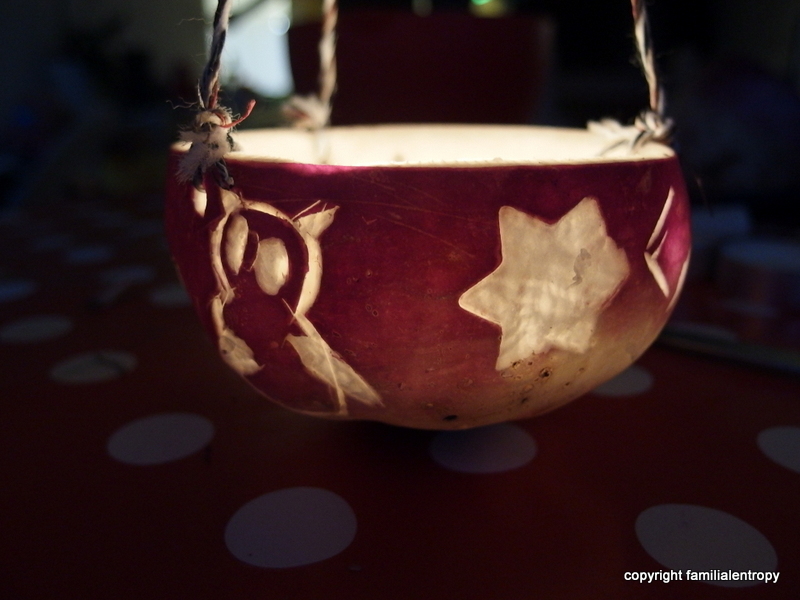 In Switzerland, the farmers bring in the last harvest from the fields at the beginning of November and in order to celebrate this occasion, children are carving beets and illuminate them with candles. In every village and town you’ll find parades with these enlightened beets, even with music and food and – as in our town – with extra-dark streets. 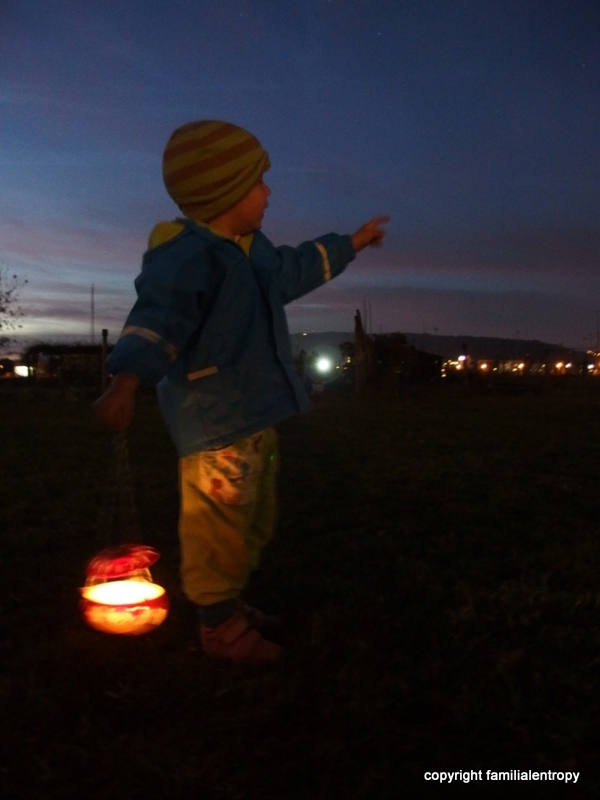 While I know a similar tradition from Germany (we used to celebrate the 11th of November as St. Martins day and made lanterns in order to join a parade and then go from door to door to sing songs), the so-called Räbeliechtli was new to me. But one of the great things about having children is that you can completely engage in these traditions again. So, on said evening the little one was already in her pyjamas, covered with a warm jacket and a scarf and put in her buggy in order to watch the parade. 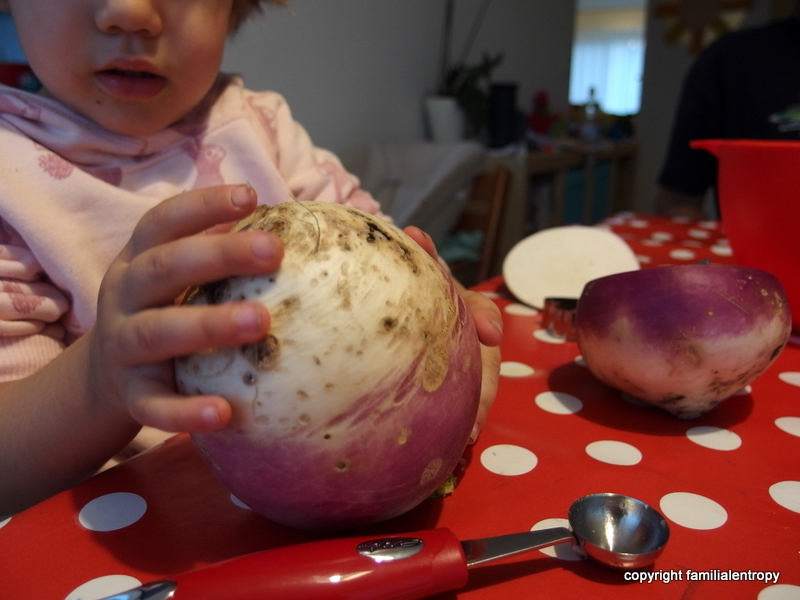 She was completely thrilled, especially since we met a family from her playgroup and they gave her one of their carved beets (Räbe!). That evening, when brushing her teeth, she cheered and said:“Mom, I am happy!”. That goes right to my heart, that sentence…. 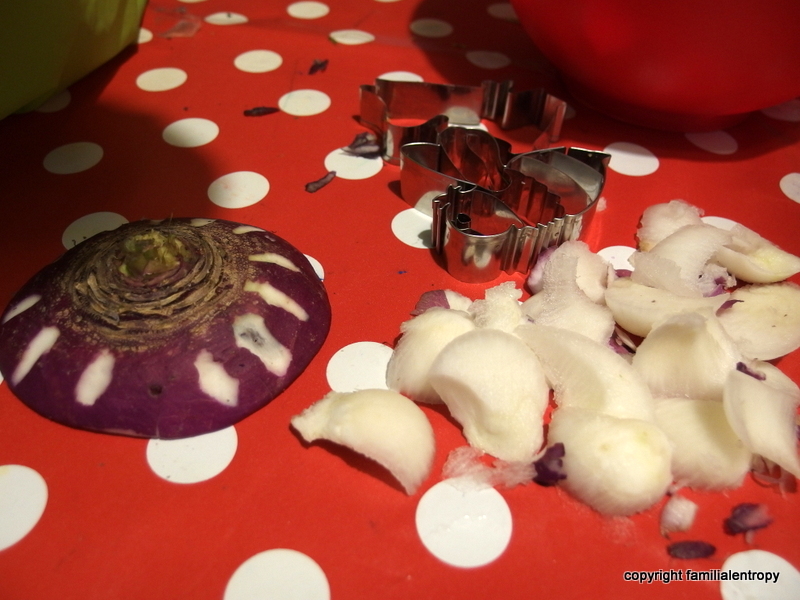 Yesterday, we therefore planned to go and carve beets ourselves. Since we are unexperienced Germans, we wanted to join one of the many “carving sessions” at a local family centre. Unfortunately, the little one was too tired and grumpy as she didn’t have her lunchtime nap, so I decided to swing by the family centre in order to see how it is done and then I bought two beets and a thingy to carve (originally to carve melons) and we did it at home. This entry was posted in small but significant differences, Switzerland, the little one and tagged autumn, November, Räbeliechtli, Switzerland, tradition. Bookmark the permalink.